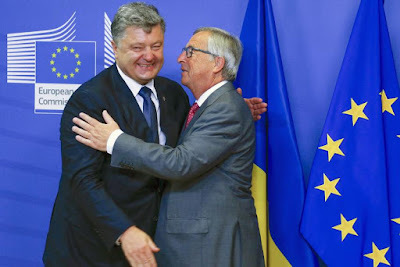 BRUSSELS, Belgium -- European Commission President Jean-Claude Juncker has dashed Ukraine’s hopes of joining the EU and NATO anytime soon, estimating that it will take at least two decades before the former Soviet state is a member of either. Ukraine President Petro Poroshenko (left) is welcomed by European Commission President Jean-Claude Juncker in Brussels, Belgium, August 27, 2015. Juncker has dashed Ukraine’s hopes of joining the EU and NATO anytime soon. “Ukraine will definitely not be able to become a member of the EU in the next 20-to-25 years, and not of NATO either," Juncker said during a speech in the Netherlands, Radio Liberty reports. The European politician did not explain why Ukraine was so far from membership but he made the claim while reassuring Dutch voters that despite new moves to bring Kiev closer to the EU, this was not a precursor for membership. The EU’s free-trade agreement with Ukraine which came into force in January will be the subject of a non-binding referendum in the Netherlands in April. Juncker assured Dutch voters that the deal would not speed up Ukraine’s potential entry into the EU. Pro-European protesters toppled Ukraine’s then-President Viktor Yanukovych in 2014 after he made a controversial move to refuse an EU association agreement in 2013 that pulled Ukraine further from EU integration. Since then, Ukraine’s new government has vowed to carry out pro-Western reforms and President Petro Poroshenko has promised to hold a referendum on joining NATO whenever reforms are complete. As fighting with Russian-backed rebels in eastern Ukraine has bled into a low-intensity war inside Ukraine, NATO has been helping Kiev’s military adopt Western standards. But the help has not extended to providing combat support. Despite Juncker’s claims, Kiev continues to hope for the implementation of a visa-free relationship with the EU, while the EU and U.S. remain big stakeholders in Ukraine’s developments after granting Kiev a 1.8 billion euro ($2 billion) loan. Ukraine will enter the EU and NATO when it suppresses corruption and becomes a militarily powerful and economically prosperous state. Europe will then beg Ukraine to join. It is quite possible that little will remain of the EU and NATO 20-25 years from now except footnotes in history books. The demographic crisis may kill it off and there will be nothing of value to become part of. And that part which still has any substance and merit will want to join with Ukraine, Poland, Georgia, the Baltic states, and (possibly) a post-Lukashenko, (truly) sovereign Byelorussia. Ukraine must first look to cleaning up its stables and getting its own house in order. There will be plenty of time - then - to consider EU and NATO affiliation. Nothing other than military and economic strength will make a dime's worth of difference in those deliberations.